Do you want to create a rug that looks 3 dimensional? Starting with quilt blocks we will design optical illusions to give an impression of depth. We will manipulate form, line, color, value and repeated images for special effects. Special emphasis will be placed on color (hue, value and intensity) to create the “Illusion”. At the end of this class students will have a solid foundation to create the illusion of depth in geometrics as well as landscapes, portraits and other rugs. Wool beads are one of the ways to make “standing wool rugs.” In this class you will learn the fundamentals of making wool beads or quillies. This simple technique can be used to make coasters, trivets, jewelry, small mats, and larger rugs. In class we will make a coaster and trivet using two different techniques. One technique uses glue and the other requires using thread and needle. Both techniques are fun and easy to learn. Using quillies as embellishments on hooked rugs will be demonstrated. 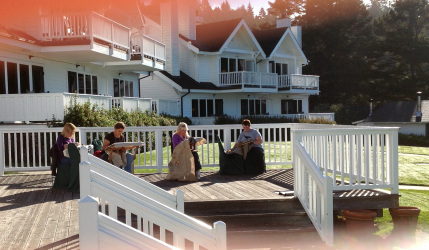 California's 1st ATHA ChapterMay 18, 2013, 10:00-3:00 p.m.
Students hooking on the deck at LRI 2012. The weather was perfect for sitting outside. All the rooms are facing the ocean. The view was spectacular.